Early February we got indeed a retest of the MA 76 from below as written in my January post. After that retest I expected wave 3 to start somewhen in mid February. Although we got a selloff down to 1045 this was not Minor wave 3. It was only the end of Minor wave 1. A rally followed (Minor wave 2) which didn't stop until it challenged the MA 76 for a second time in late February. The high so far for wave 2 is at 1112, right at the 62 % retracement level of wave 1. Bearish count: Wave 2 may have topped out at 1112 or may have not. The action from the top at 1112 looks corrective so far, thus we may see a new high next week. Bullish count (alt): In the chart below I added an alternative bullish count. In this count we finished wave (4) of  or [A] up and are already in wave (5). I don't like this alternative though, wave (3) just doesn't look like a third wave. 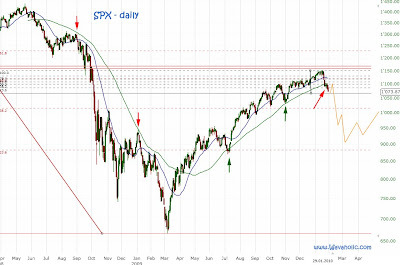 But should the market make new highs this will be a count we have to consider and we may be on the way up to the 62 % retracement level of the 2007-09 bear market. In the past years the market always made an important top or low in March. 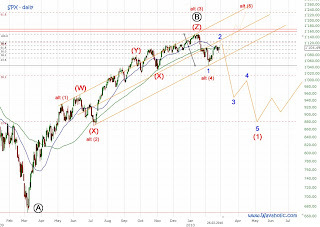 While my preffered Elliott Wave count suggests a top in March (wave 2) there are many cycles which bottom early March. So, a mixed picture at the moment but I hope it will become clearer after the first trading days in March. The market decline in Jan looks like it is wave 1 of 1 of C. But the rally since 1045 has confused me. It's very atypical that wave 2 would be so prolonged and retrace so much of wave 1 if we are at the start of a major bear market. Hello hello my friend :). I love your charts ehehe! They are magical :). I agree with Rajiv so I believe more on new highs. Regards. Hugo: You make a good point. Let's wait and see if and when how wave 3 unfolds. We do know that minor wave 1 was pretty quick and decisive. And minor wave 3 should be faster and longer than wave 1. We will know in the next couple of weeks. Also, what we do know is that a breach of 1150 would change almost every elliotician count.